Instantly, the Bichen on Lan WangJi’s back unsheathed and stabbed into the water. After a moment, it flew out of the river with a sharp resonance, taking with it a crescent of water. Yet, it didn’t pierce anything. He held the sword in his hand with a stern expression. As he was about to speak, a disciple on the other side also drew out his sword, thrusting it toward a dark shadow which swiftly swam by in the water. He realized, before he even finished speaking, how unsuitable this sentence was. No matter what, the Bichen sword or Lan WangJi were not comparable with others. Lan WangJi could enter his sword into water when the opponent was unknown and be just fine, but it might not be the case for others. An embarrassed shade of red seeped through his pale complexion, as if he had been disgraced. He glimpsed at Lan WangJi, but Lan WangJi didn’t look at him, and instead attentively observed the water. In an instant, Bichen was unsheathed again. This time, the blade of the sword wasn’t inserted into water, but instead, the tip of the sword jolted, and whisked up a piece of shadow from within the water. A pile of wet, black mess fell onto the floor of the boat with a plop. Wei WuXian went on his toes to have a look. To his surprise, it was a piece of clothing. Just as he finished his words, everyone suddenly felt their boats sinking. Water immediately started to spread into the boats. Wei WuXian suddenly noticed that the color of Biling Lake’s water wasn’t dark green any more, but almost black. Surrounding the area close to the center, a large whirlpool had formed without anybody realizing. The ten-or-so boats circled around, following the currents of the whirlpool. They sunk as they spun, as if they were going to be sucked inside a gigantic, black mouth! The clang-s of drawing swords chorused in the air. One after another, everyone mounted their swords and flew upward. Wei WuXian already hovered above. He looked downward, only to see that the disciple who drove his sword underwater, Su She, was already knee-deep inside the water, the board of his boat already engulfed in Biling Lake. Although his face was full of panic, he didn’t call for help, possibly frightened rigid. Without hesitation, Wei WuXian bent down and stretched his arm out, grabbing Su She’s wrist and pulling him up. Having added another person, the sword under his feet dipped abruptly, but it continued to ascend. However, not long after, a strong force suddenly came from from Su She, almost pulling Wei WuXian off of his sword. As they heard the name “waterborne abyss”, Wei WuXian and Jiang Cheng understood immediately. The scariest part about Biling Lake wasn’t water ghouls, but the water which flowed in it. Because of reasons such as terrain or currents, some rivers or lakes often encountered sinking ships and drowning people. As time went on, the area of water would develop a personality. It was like a spoiled young mistress who couldn’t tolerate a shortage of the luxurious lifestyle. If no boats of goods or living humans sunk into the water as sacrifices, it would stir up trouble and obtain them on its own. The people of the Caiyi Town area were all familiar with water, so sunken boats and drowning deaths rarely happened. It was impossible for a waterborne abyss to grow out of here. Now that one had appeared here, there was only one possibility—that it had been chased here from somewhere else. Once a waterborne abyss emerged, it meant that the whole body of water was turned into a monster. It was extremely hard to get rid of, impossible to remove unless every single drop of water was taken out, all of the people and goods which sunk were fished up, and riverbed was exposed to strong sunlight for a few years. Nevertheless, there was a method that could solve the immediate problem at the expensive of others—to chase it to another river or pond and let it wreck somewhere else. Lan XiChen pointed at the sky. He was pointing at nothing else but the sun. Wei WuXian and Jiang Cheng looked at each other, understanding it perfectly, It’s the QishanWen Sect. Among the cultivation world, there was a countless number of sects and clans, exceeding even the number of stars in the sky. And, among these, there was a titan which stood above the others without a doubt—the QishanWen Sect. The Wen Clan used the sun as the motif of their clan, signifying that they could “compete with the sun for radiance, match the sun in longevity”. Its sect residence was quite large, almost comparable to a city. It was named the Nightless Sky, also called the Nightless Celestial City, because it was said that there was no nightfall in the city. It could be described as a titan for the fact that no matter in terms of the number of disciples, power, land, or magical tools, there were no other families which could compare to it. A great deal of cultivators took being a foreign disciple to the Wen Sect as a supreme honour. Based on the Wen Sect’s style of doing things, it was highly possible that the waterborne abyss in Caiyi Town was chased here by them. Although they knew where the waterborne abyss came from, everyone grew silent. If it was done by people of the Wen Sect, then there would be no result no matter how hard they accused or criticized. First of all, the sect wouldn’t admit it, and second, there wouldn’t be any compensation either. They boarded new boats at the crossing point and paddled toward an area of town where a lot of people gathered. After passing the arch bridge and entering the river paths, Wei WuXian started to go at it again. Lan WangJi didn’t expect Wei WuXian to suddenly talk about him at all. Just as he was unsure of how to respond, the women on the river spoke in harmony, “Even more handsome!” Amid this, there seemed to be the laughter of a few men. Lan WangJi threw a “pathetic” at him, and got on another boat. Wei WuXian didn’t expect him to really answer. He just wanted to tease him, after hearing the amusingly soft Gusu dialect and thinking that Lan WangJi undoubtedly also spoke this dialect when he was young. After raising his head to swallow another gulp of the rice wine, he carried the plump, jet-black jar in one hand, picked up the paddle, and charged over to beat up Jiang Cheng. On the other hand, Lan WangJi stood side by side to Lan XiChen. This time, even their expressions were similar. Both looked as if they were preoccupied by troubles as they thought about things such as how to deal with the waterborne abyss and what to say to the mayor of Caiyi Town. An extremely heavy boat came from in front of them, filled with buckets of large, golden loquats. 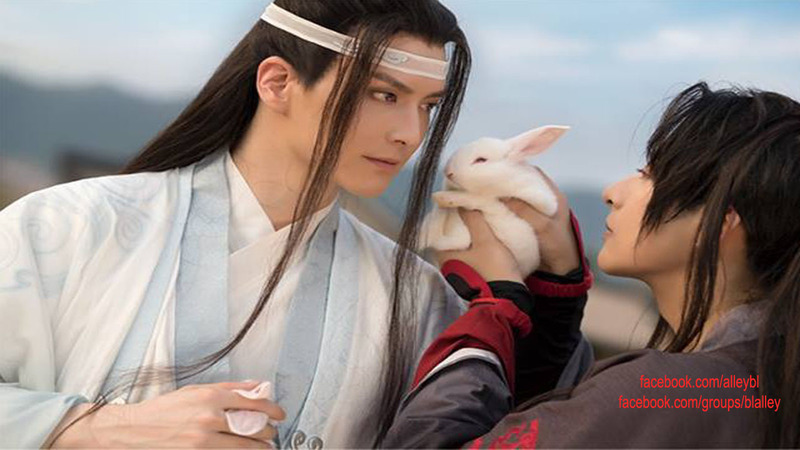 Lan WangJi took one glance at it, and continued to look straight ahead. He went to stand on another boat. Sword incantation: These are what one says to command or summon one’s sword. Sisters: In China, it is respect to refer to someone older than you as Sister or Brother, and Younger Sister or Younger Brother if the person is younger than you. Frivolous peach blossoms pursuing the running stream: Again, this phrase comes from a poem by the famous poet Du Fu. This scene of blossoms and the stream implies that Wei WuXian is the “frivolous peach blossom” in this case, and flirts with the women in the river without caring about his conduct. Bamboo hat: As Caiyi Town is a “water town”, much of the residents there wear bamboo hats which form a conic shape, resembling the famous Vietnamese hats. It is also called a conic hat or a rice hat. Wu dialect: This is one of the many dialects of Chinese.